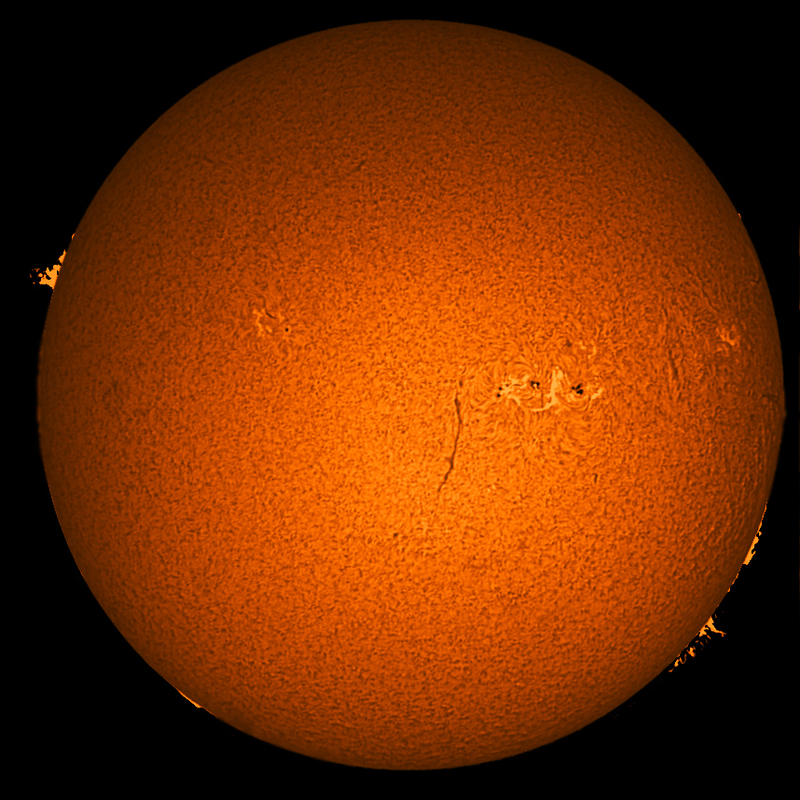 Pete Hill took the following three images of the Sun in H alpha light on the 19th July 2016. They were taken through a Coronado PST using a DMK41 camera (600 frames at 15fps) and 2x Barlow lens. The images were stacked in Autostakkert and used wavelets in Registax 6. Images © Pete Hill. 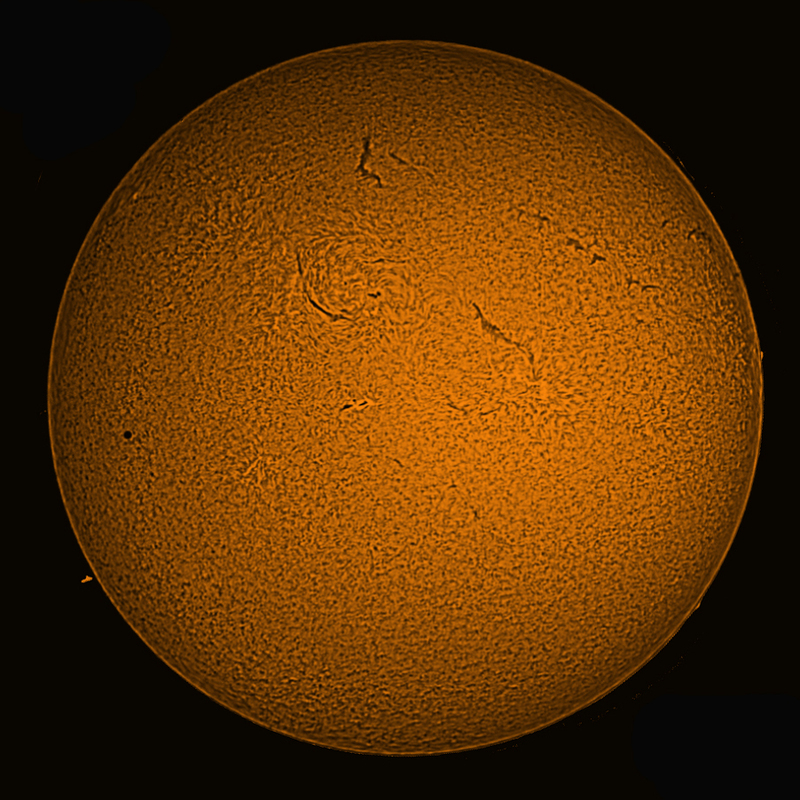 This full disc image of the Sun in H alpha light was taken by Pete Hill on the 19th July 2016. It was taken through a Coronado PST using a DMK41 camera (600 frames at 15fps) which gives a full disc image without any additional lenses. This composite of disc detail and prominences was stacked in Autostakkert, used wavelets in Registax 6 and was combined and colourised in PS6. Image © Pete Hill. 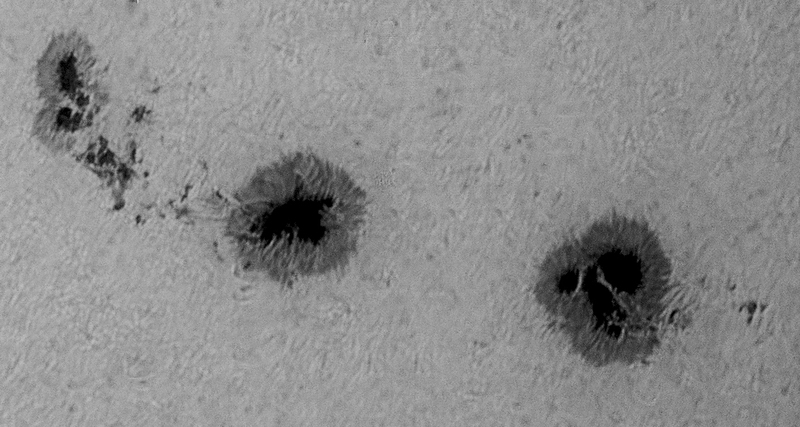 Pete Hill captured this image of a large sunspot group in white light on the 19th July 2016. For this he used an Evostar 120mm telescope with a Lunt Herschel wedge mounted on an HEQ5 pro mount tracking at solar rate. A DMK41 mono CCD camera was used with a Baader continuum filter and 600 frames of .avi were taken at 15 fps. These were stacked in Autostakkert, and wavelets were used in Registax 6 and a final polish given in in PS 6. Image © Pete Hill. 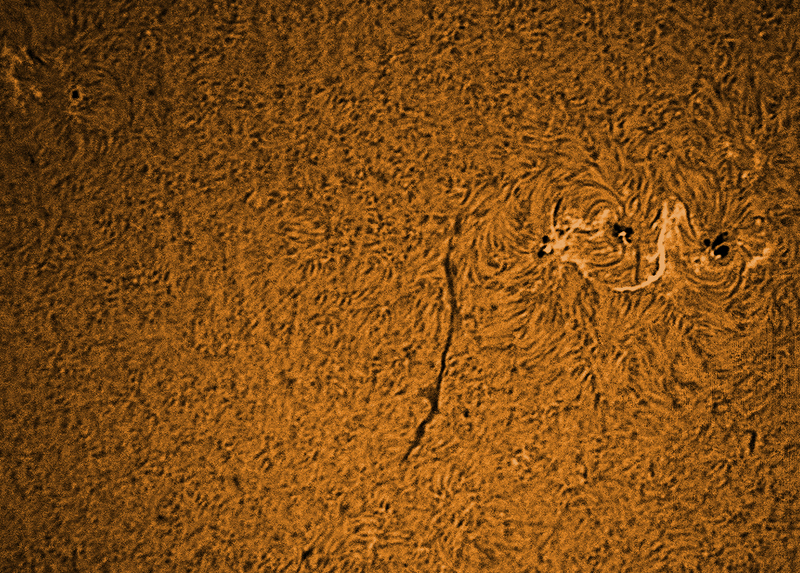 This white light image of the Sun was captured by Pete Hill on the 19th July 2016. He used a Canon 450D camera attached to Hyperion zoom set at 24mm with a x0.5 focal reducer and Baader continuum filter, ISO 100, and 1/320 second exposure. This setup was through an Evostar 120mm telescope with a Lunt Herschel wedge mounted on an HEQ5 pro mount tracking at solar rate. The raw image was processed in PS6. Image © Pete Hill. Pete Hill captured this image of the transit of Mercury on the 9th May 2016 from the Rosliston Forestry Centre. It is a composite of images taken with a Canon 450D camera fitted with a 150-500mm Sigma zoom lens and Baader ND3.8 solar film filter fitted on the lens hood. ISO 100 F29 set on 500mm on an alt/az tripod with remote shutter release, exposures varied between 1/1000" to 1/300" depending on conditions, cloud etc. Shot in RAW and processed in PS6. 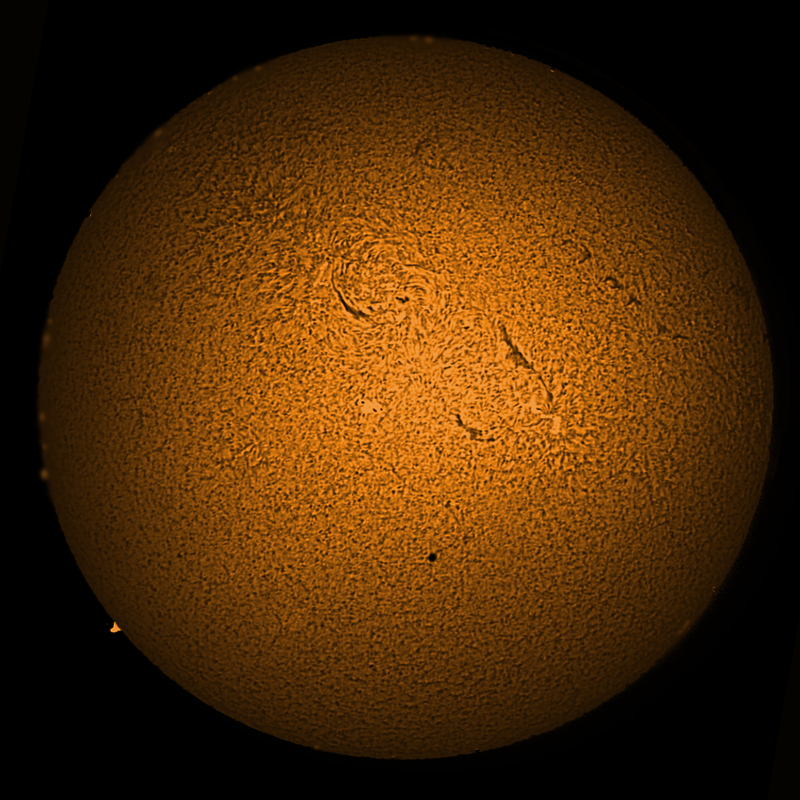 The image shows the internal ingress of Mercury onto the solar disc at approx. 12:15 BST then its position at 13:00, 13:41, 14;30, 15:40, 16:25, 17:30, and 18:28. The curve is due to the Sun's rotation with respect to the zenith during the day. Image © Pete Hill. 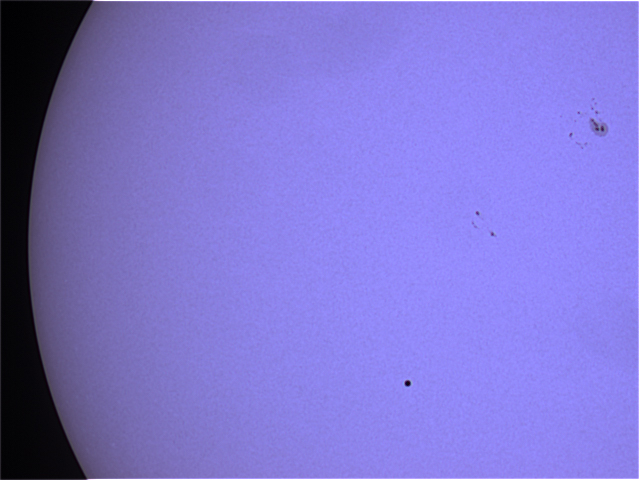 Pete Hill also captured this image of the transit of Mercury on the 9th May 2016 at 13:10 BST. 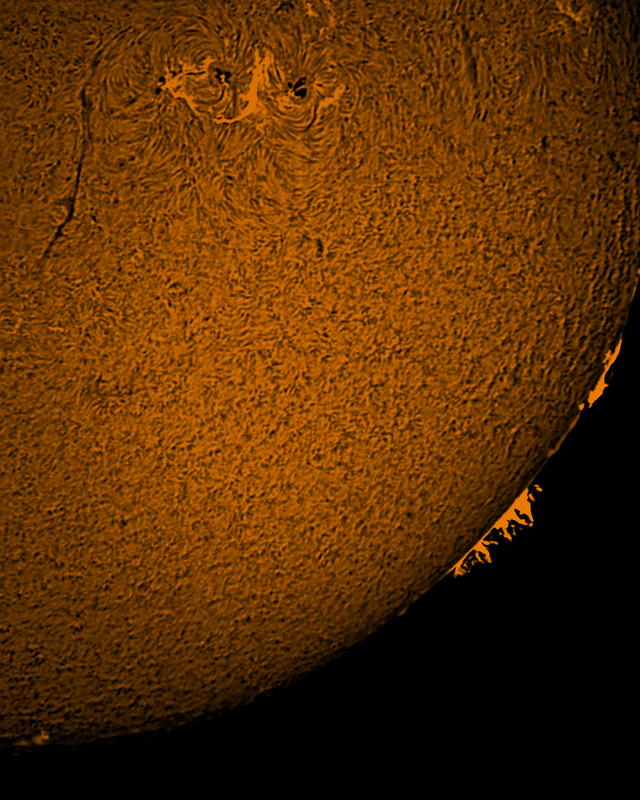 The image was taken in H-alpha with a Coronado PST piggy-backed on a 5" Evostar refractor and HEQPro mount. The camera was a mono CCD DMK41 taking 15fps. Frames were stacked in Autostakkert.2, wavelets processed in Registax 6, and final processing, including colourising, in PS6. Image © Pete Hill. 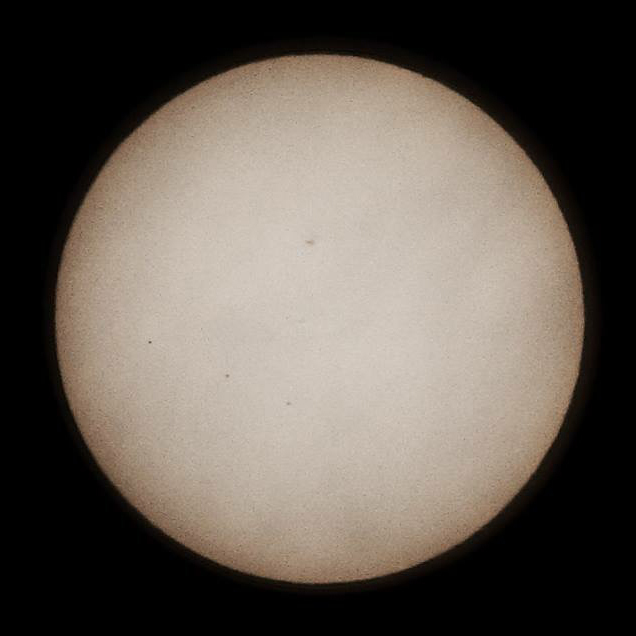 Pete Hill captured this image of the transit of Mercury on the 9th May 2016 at 17:00 BST. The image was taken in H-alpha with a Coronado PST piggy-backed on a 5" Evostar refractor and HEQPro mount. The camera was a mono CCD DMK41 taking 15fps. Frames were stacked in Autostakkert.2, wavelets processed in Registax 6, and final processing, including colourising, in PS6. Image © Pete Hill. 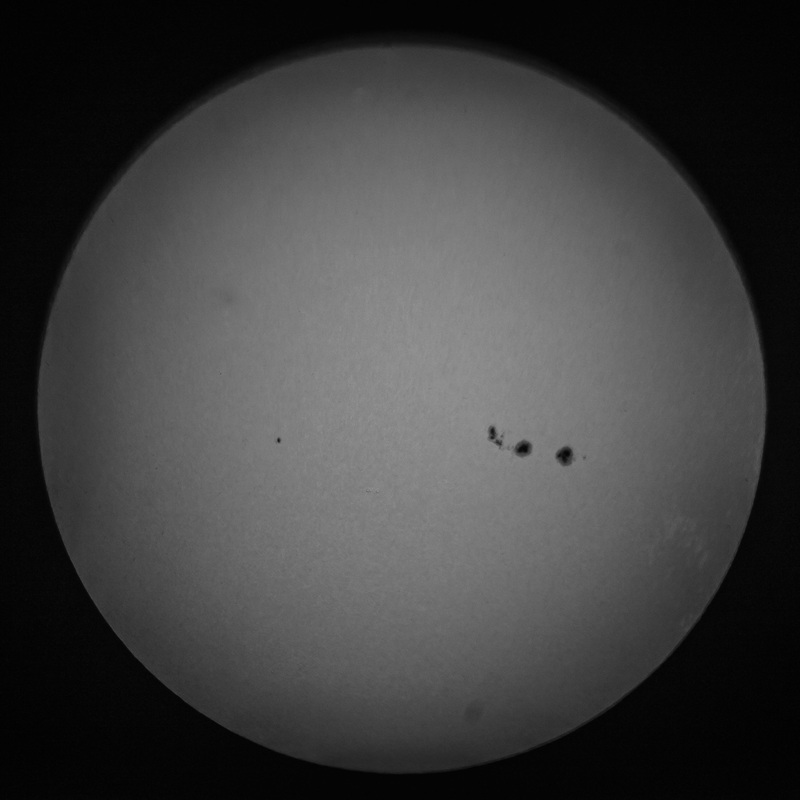 This animation of the transit of Mercury on the 9th May 2016 was assembled by Pete Hill from images taken with a Canon 450D camera fitted with a 150-500mm Sigma zoom lens and Baader ND3.8 solar film filter fitted on the lens hood. ISO 100 F29 set on 500mm on an alt/az tripod with remote shutter release, exposures varied between 1/1000" to 1/300" depending on conditions, cloud etc. Shot in RAW and processed in PS6. Image © Pete Hill. Barry Ashforth captured this image of the transit of Mercury on the 9th May 2016 from Derby using a Sky-Watcher 80mm APO and DFK21AU04 camera. The image was processed in RegiStax 5. Image © Barry Ashforth. 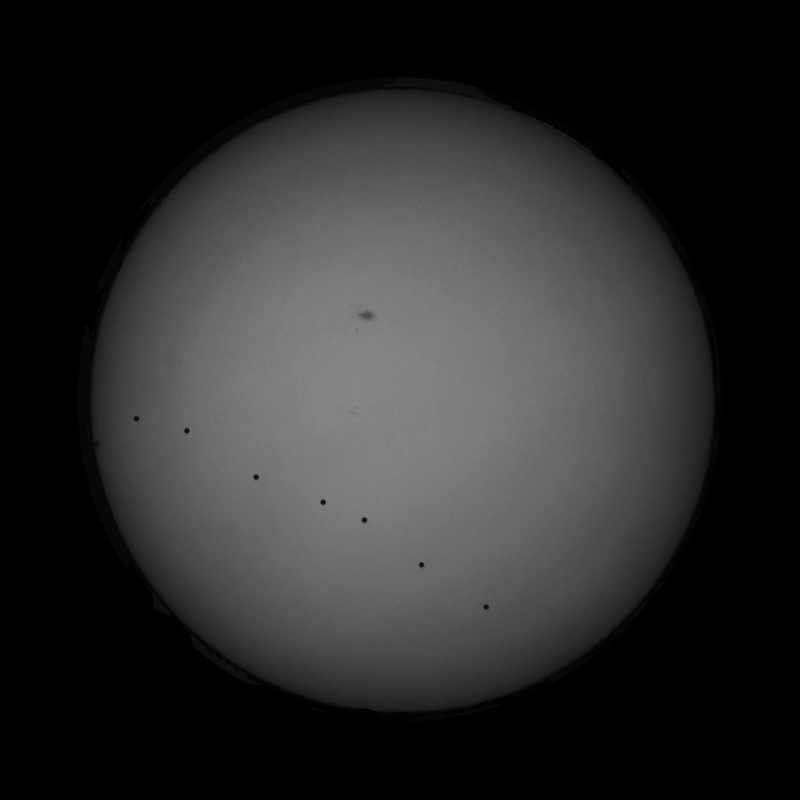 This image of the transit of Mercury on the 9th May 2016 was taken by Chris Newsome. It is a three image stack taken with a Canon 7D camera, a 300mm lens, a 1/8000 s exposure at f18, 10 stop ND filter, and 100 ISO. Image © Chris Newsome.